These lemonade scones are light, fluffy and rise like a dream. The dough is easy to handle and cut and they are so simple to make. If you want to be the hero in your workplace, or are looking for a winning dish to bring to a picnic – try making these lemonade scones. Serve with a selection of jams, and whipped cream. Use a HOT oven, I use a 190°C fan forced. If taking the scones somewhere pack them in a tea towel lined basket if still warm, otherwise they will steam and go yuck in a tupperware type container. 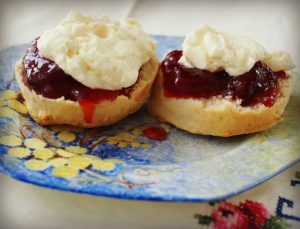 This recipe makes around two dozen scones and is designed to feed a crowd – halve if you need to. Preheat the oven to 200 C, and grease and flour two baking trays. Sift together the SR Flour and Salt into a large mixing bowl. You can also use a mixer with a dough hook attachment. Make a well in the centre of the flour, and add the cream and lemonade. Use a butter knife to mix together, or use a low speed setting on your mixer. Once the ingredients come together, turn out onto a floured bench to knead – or increase the speed on your mixer. The dough is ready to cut when it is pliable and loses some stickiness. If using the mixer, just bring the ingredients together and then form a dough, turn out onto a floured surface to knead and then push into shape. Push the dough down with your fingertips, so it is around 4cm high – no need to use a rolling pin. Using a scone cutter, cut rounds into the dough and place onto a lightly greased and floured tray. Place the scones close together, so they rise up with support from their neighbours. Bake for 10-12 minutes for larger scones (10cm across), or 8 minutes if you used a smaller cutter (say 6cm across).